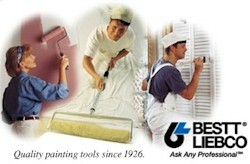 BESTT LIEBCO continues to lead the way to meet painters' needs. We were the first to offer DuPont Orel® polyester as a painting filament in 1970. In 1989, we were the first manufacturer to use DuPont's Chinex® bristles, which have since become recognized as the finest applicator filament available for applying today's paints. Likewise, our roller products have set industry standards for many years. Our Tru Pro® roller covers were the first synthetic fabric roller covers in the United States, and our Long John® small diameter roller was the only product of its kind in the U.S. for many years.